A Giant Floating Duck That Generates Solar Power—Because, Why Not? 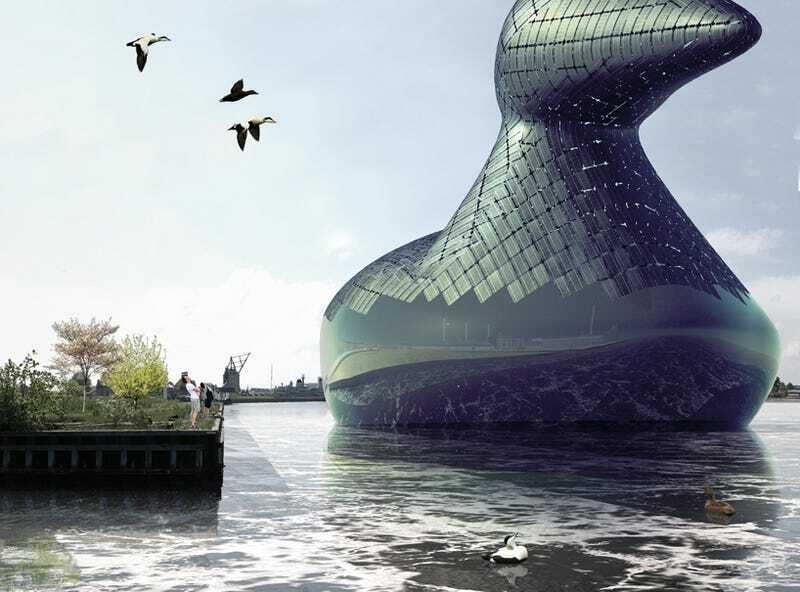 A group of artists, scientists and engineers have proposed a novel solution to help Copenhagen's achieve its goal of becoming a carbon-neutral city: a 12-story-high solar energy farm in the shape of a duck. Energy Duck is the brainchild (brainduckling?) of the Land Art Generator Initiative (LAGI), which designs public art installations that also function as utility-scale clean energy generators. The common eider duck resides in great numbers in Copenhagen; however, its breeding habitat is at risk from the effects of climate change. Energy Duck takes the form of the eider to act both as a solar collector and a buoyant energy storage device. Solar radiation is converted to electricity using low cost, off-the-shelf PV panels. Some of the solar electricity is stored by virtue of the difference in water levels inside and outside the duck. When stored energy needs to be delivered, the duck is flooded through one or more hydro turbines to generate electricity, which is transmitted to the national grid by the same route as the PV panel-generated electricity. Solar energy is later used to pump the water back out of the duck, and buoyancy brings it to the surface. The floating height of the duck indicates the relative cost of electricity as a function of citywide use: as demand peaks the duck sinks.